I noticed her in Faith also. an animated picture for our queen for her new drama. and a video at the presscon..
Wow thanks for the update, she look great in modern haha. Can't wait to see it. Surprisingly I was hoping Daniel Choi and her, but then Daniel CHoi was a teacher. He is playing alot of excellent but mature characters, he is onlya year older than Se young. I am glad Se young is playing younger characters, at the same time with the mature Queen Noguk she can start getting sophisticated character later. @livon123 wow i'm shocked that Daniel is only one year older than her... i had to search it on wiki right away just to confirm it!!! I know right? haha well she is beautiful in the photoshoot. I hope she get a leading lady role next year. LOL, I am into detective series, hope she can play a cop, lawyer, or doctor lol. she looks good to almost every men she paired with!!!! i'm having a bipolar disorder right now!!! I CAN'T CHOOSE whom to ship!!! hahaha, I agree, she just looks great with everyone she pair up with, and they become a couple I cheer for. Looking forward to School 2013! Actress Park Se-yeong may look cold and unapproachable from afar, but she quickly opens up and shows her warm personality as she strikes up conversation. The 24-year-old newcomer resumed her acting career last year by appearing in several TV soaps. Recently she drew attention for her role in the SBS drama "Faith". She is now starring as a nerdy student in the new KBS drama "School 2013", which began airing early this week. "I feel like I'm growing as an actress as I'm building my career through TV appearances little by little", she said. She has picked up the sobriquet of "Indian Princess" for her exotic looks. Park made her acting debut in a TV drama in 2002 when she was still a child, but left showbusiness to concentrate on her studies. She has returned to acting with renewed vigor after she was contacted by her old agency, she said. "I just had this vague daydream of becoming an actress since I was in elementary school", she said, "Then out of the blue I got a phone call from an agency I worked with when I was a child, and it led me back into this world". She is currently studying film and media studies at Sangmyung University. "I'd rather be remembered for the characters I play than anything else", she said. "I hope I get the chance to show my versatility with a range of roles in the future as I've only just started out". Park Se-yeong and Ryoo Hyo-yeong took playful pictures together. 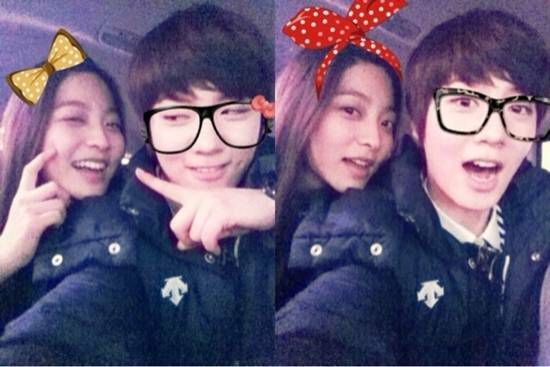 Park Se-yeong posted pictures she took with Ryu on her Twitter on the 16th. The two are being playful in the pictures which seem like they are in a car during stand by. The way they've decorated the picture with ribbons and glasses show her high school girl's sensitivity. Netizens say, "They are so cute", "It's good to see they are as close as they are in the drama" and more. Meanwhile, on the fourth episode of the drama "School 2013", Kang Se-chan (Choi Daniel) froze as he saw Song Ha-kyeong (Park Se-yeong) unconscious. This showed he had trauma. Park Se Young's fashion in Love Rain drama. I really like her fashion in the drama so I screen captures all her scenes. She's my new fav young rising actress and she did a great job in Faith. Please credit me if taken out.